I enjoyed this site very much, all the wonderful pics from the past brought back great memories. 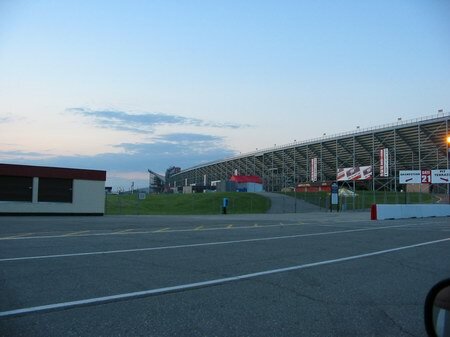 I am writing to you because I have some updated pics of Michigan International Speedway and would love to send them. I have been a Season Ticket holder for 8 years now, this year I was able to go down to the track for Pre Race Ceremony and Driver's Intros it was a great time and an awesome experience Thank you. i am trying to get info on the 1970 season. Between the Champ car race in 1968 and the Motor State 500 in June 1969, there was a Trans Am race run on the road course May 10, 1969. Race was initially won by Mark Donahue, but was later given to Parnelli Jones in a Bud Moore Boss 302 Mustang. A spectator was killed during the running of the race and from what I recall there was sleet and snow. Overall not a good debut for Trans Am at Michigan. One week ago, I paid my first visit to a NASCAR Event at MIS and wached the closest finish in the truck race there on saturday and then watched my guy Jr, win on sunday. It was a very cool weekend. When up in the grandstands, I took a few pics and got the first views of the inside of the track that I can remember. There is still some remnants of the old road couse. They added a lot of seats over the years, but the track still has a lot of the old look that has been there since day one in 1968. A cool place, I just wish they didn''t sell alcohol so I could really enjoy the race with out people getting up to go to the bathroom every 5 minutes after they drink half a case on the grandstand. All in all it was a pretty cool experience and I may go back again some time. A little info I dug up on MIS:Michigan International Speedway was built beginning in September of 1967, and opened on October 13th, 1968, with a USAC Indy car race. NASCAR Grand National first ran here on June 15th, 1969. A 3. 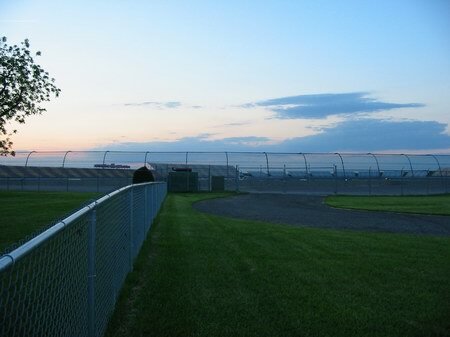 5 mile road course which used part of the oval, and also had sections both inside and outside of the oval, was used from May 11th, 1969 to July 1973. A 1. 9 mile road course in the oval has been used intermittantly since 1984. The facility was purchased by Penske Corporation in 1973.
there was indeed a road course that exited and cam back in across the back straight. Then AMC leased it for testing in the early 70''s I think and then it was done. happened around 74. The Waterford guys used to run out there in an enduro. The Waterford 25 year anniversary book has some info and pictures of it. I could be wrong,but I think the road course has been removed. Does anyone know when this happened? Anybody out there have any old photos from the Can Am races back in the day? This stuff needs to be displayed. This has been driving me nuts for about 10 years. One night on TV I saw only part of some old Charles Bronson movie where he played an assassin. In it, hes trying to shoot a Can-Am race car driver as the cars race around the MIS road course. The scenes contained lots of real Can-Am footage from 1968, 69 or 70, including the cars lined up on the grid for the start, facing clockwise. I never found out the name of the movie. Anyone know which movie this is? Its definitely NOT the movie where he plays the assassin who mentors a younger assassin played by Jan Michael Vincent. Email me at rbyrne@healthleaders-interstudy. com if you know. Michigan International Speedway is a two-mile superspeedway and two 1. 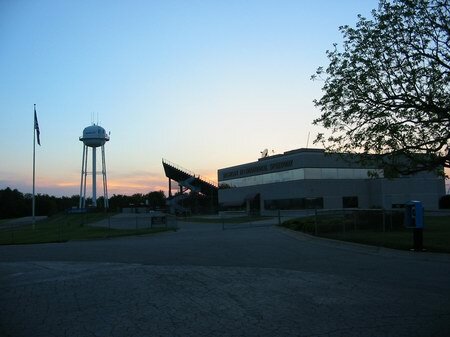 9-mile road courses situated on 816 acres in the Irish Hills area of southeastern Michigan. The D-shaped oval has turns that are banked 18 degrees, while its front straight is 12 degrees and its back straight is 8 degrees. Today, top drivers from NASCAR, PPG IndyCar World Series, IROC, and ARCA showcase their talents in front of more than 350,000 spectators, and live television and radio audiences annually. Groundbreaking took place on September 28, 1967. The prime mover inthe venture was Lawrence H. LoPatin, a Detroit area land developer who was the first president of American Raceways, Inc. , the tracks parent company. 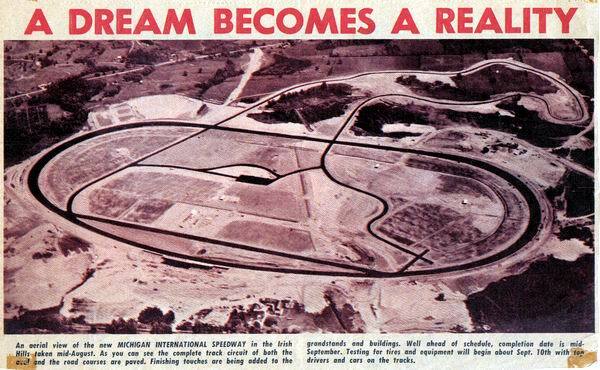 The designers of the track were Charles Moneypenny, who also designed the oval at Daytona International Speedway, and Sterling Moss, the Formula One great who styled the MIS road course. In 1972, American Raceways, Inc. , which operated a number of race tracks, went into receivership which allowed MIS to maintain its schedule. 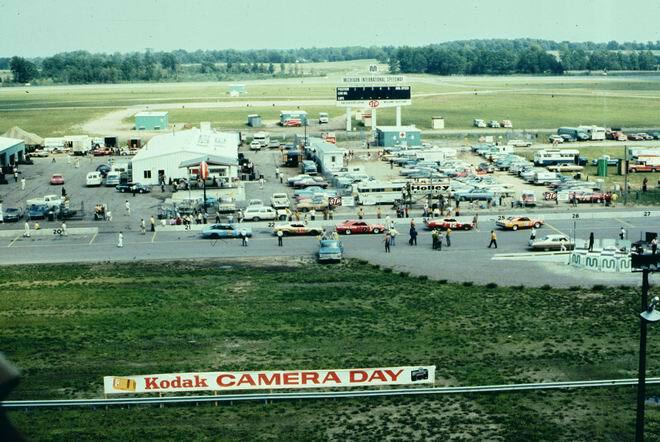 Then, in May of 1973, Penske Corporation purchased MIS and immediately started an innovative improvement plan which made it one of the countrys finest racing facilities. 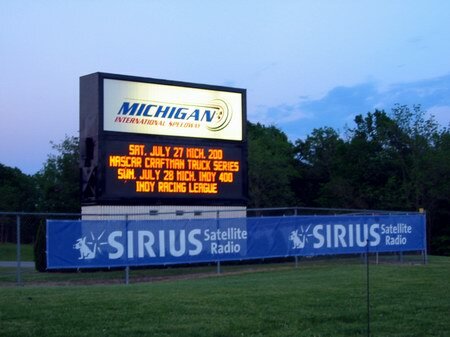 Today, MIS is considered a premier racing facility,hosting six major racing events during June, July, and August. Michigan International Speedway boasts a proud 35-year history of hosting Americas best racing action on its 1,200-plus acres in the scenic Irish Hills. With 18 degree banking and 73-foot wide sweeping turns, Michigan International Speedway provides drivers with three and four grooves to run around the two-mile speedway. When Michigan International Speedway opened in 1968, the 12,000-seat center grandstand stood overlooking the new two-mile oval, a symbol of a new era for the Irish Hills area. With smaller grandstands on each side, the track proudly boasted 25,000 seats. No one at the time suspected it was the start of something much, much bigger. Since its opening, the success of the speedway and the growth of motorsports has made Michigan International Speedway the largest sports arena in Michigan. The center grandstand was extended in 1985, in 1989, and again in 1990 to seat over 27,000. In 1999, a 28,000-seat, 10-1/2-story high structure was added to the center grandstand, increasing the number of seats to 55,000-more than four times its original size. In 1990, the first of two of the seven grandstands in turn one were erected, and in 1992, the first North Concourse grandstands (turn four) were built. By 1997, the eighth North Concourse grandstand was built in turn three. 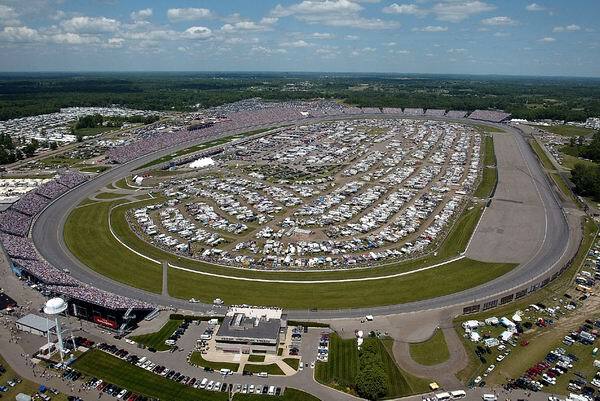 Over the last decade, Michigan International Speedway has increased its reserved seating capacity by 82,000, and since 1985, the Speedway has increased its seating by nearly five times. After more than 30 years of improvements and updates, Michigan International Speedway is still considered one of the countrys premier racing facilities.